Malphas is a Great President and a Prince to some authors, having forty legions of demons under his command. 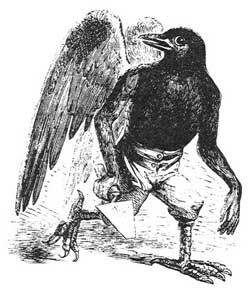 Malphas is depicted as a crow that after a while or under request changes shape into a man, and speaks with a hoarse voice. Malphas builds houses, high towers and strongholds, throws down the buildings of the enemies, can destroy the enemies" desires or thoughts (and/or make them known to the conjurer) and all what they have done, gives good familiars, and can bring quickly artificers together from all places of the world. Malphas accepts willingly and kindly any sacrifice offered to him, but then he will deceive the conjurer. The Malphas demon is a male demon. Back to Demon Names starting with "M"